Part 2: Betty and Barney Hill: Captured! August 31, 2007 - Strathum, Massachusetts interview with Kathleen Marden continued. Portion of modern star map of our local Milky Way galaxy neighborhood. 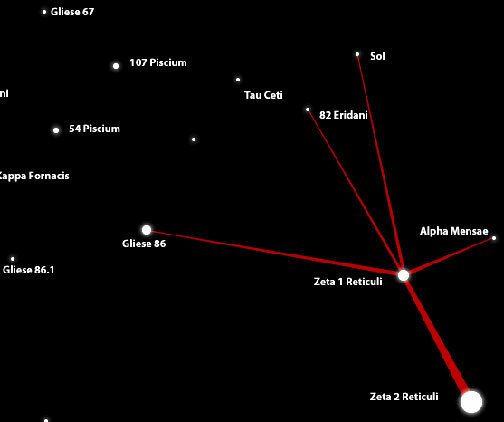 The binary star system of Zeta Reticuli is in lower right corner. Our own sun is labeled "Sol" in top right. The red lines show how close Betty Hill's 1964 drawing under hypnosis was to real sun locations in Earth's vicinity. Reproduction from scanned image by Jeffrey Pratt.